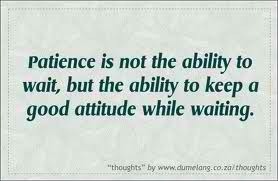 Day 2 of Learning to Allow has brought patience (or rather my lack of it) to my focus today. I never really noticed how easily I become annoyed when things or people are moving more slowly than I care for. I had an appointment today and I found myself speeding through traffic, getting anxious about not arriving on time and even once there I was annoyed that the person who scheduled the meeting with me was spending, what seemed to me to be, an extended amount of time talking with the person they were meeting with prior to my arrival. That voice in my mind begin to complain..”what is taking so long, on my God hurry up, what are they talking about, what time is it now?” On and on the thoughts went. Then the spirit of me asked a simple question…It said “Are You In A Hurry?” I sat there for a moment and realized that honestly, I was not. the meeting was the only item I had on my agenda for the day and after its completion I was simply going to head home and relax. So I said out loud to myself : “Girl, Relax” and just like that I did. My heart rate began to slow down, I could feel my whole body just do what I asked it too…it began to RELAX. I looked around and finally realized I was sitting in a gorgeous building that was beautifully decorated. I noticed the bench I was sitting on was wonderful, and it inspired an idea for decorating a room in my home. I noticed people busily moving about, and once I became present in the moment, they began to greet me and smile and say hello. It was nice, honestly, to be sitting there just taking it all in. After sitting for a little while longer the person I was meeting with came out to greet me and we headed back for our appointment. The conversation went well and I enjoyed the meeting. I also learned that the young lady she was with when I arrived had asked her for some pointers on choosing a career path and she was basically mentoring the young woman. One of my favorit things, mentoring and being of service to young adults, and there I was having an internal fit because I had to wait. I have to say that today I realized that I have been so programmed to be in “GO” mode that I have forgotten the beauty and instant peace that can be found when we learn Patience. THANK YOU for the BEAUTIFUL LESSON I LEARNED TODAY.